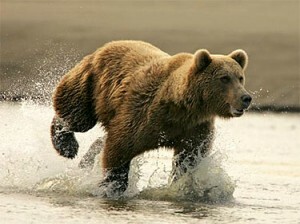 For most of my career I have hunted bear. Not the furry wild animals with big teeth, but pursuing large new customers for the businesses that I have worked for. Generally the sales process is long, sometimes multiple years, requiring consistent sales calls occasionally proving ourselves with smaller challenging projects until a contract expires, relationships change, competitive companies stumble, and we are there to step in as we have earned the trust and privilege to serve this customer. At any one time I may be courting 5 -6 customer relationships and in a good year one or two may fall. Prior to joining Blackwell Plastics, a merger between Chevron and Phillips resulted in a consolidation of business that resulted in Blackwell Plastics losing the work that represented a very large percentage of their revenues. In 2002, the plastics industry was in very tough shape with companies failing or leaving to follow the automotive, electronics, and appliance OEMs to Mexico or Asia. When I told some of my friends that I was considering the plastics molding business I was quickly told that I was crazy. Manufacturing was a dying industry and plastics manufacturing was the poster child for offshoring. I had spent considerable amount of time praying and seeking counsel from a close friend that does life coaching and felt God gave me a confident peace to take on the responsibility to rebuild this company. I imagine when Moses told his friends he was going to return to Egypt and tell the Pharaoh to “let my people go!” they told him he was crazy. I also imaging that when Joshua told the Israelites his plan to walk around Jericho 7 times and yell loud so that the walls would come down, his friends may have questioned his sanity. Obedience brings blessings. Upon joining Blackwell Plastics we organized a sales blitz. We called over 400 companies and set up more than 100 face to face meetings that generated several opportunities. I wish I could say it was our great sales expertise, but the circumstances proved it was nothing short of miraculous. Within 90 days we had five or six good opportunities and every single one of them come through. I had never seen anything like it in my career and never seen anything like it since. Obedience brings blessings is a universal life lesson that applies to our businesses, careers and families. Being obedient requires discipline and faith, but without patient obedience we may miss the blessings that come. Psalms 128:1 Blessed are all who fear the LORD, who walk in obedience to him. This entry was posted in Family Leadership, Rites of Passage and tagged christian books, christian family, christian family book, family books, family core values, family mission statement, family plan, family planning, family plans, family rules, family values, family vision statement, focus on the family, How to raise kids, Jeff Applegate, Jeffrey Applegate, parenthood, parenting, parenting articles, parenting books, Parenting skills, parenting tips, parenting websites, Raising children, rite of passage. Bookmark the permalink.